Today is the 46th anniversary of Roe v. Wade, a judicial usurpation of legislative power that reverberates to this day. Six years ago, Heartbeat International created a site in anticipation of the 40th commemoration of the tragedy that is Roe v. Wade. Among other opportunities, visitors were encouraged to post where they were on January 22, 1973, and how they will commemorate this “act of raw judicial power” (to quote dissenter Justice Bryon White). 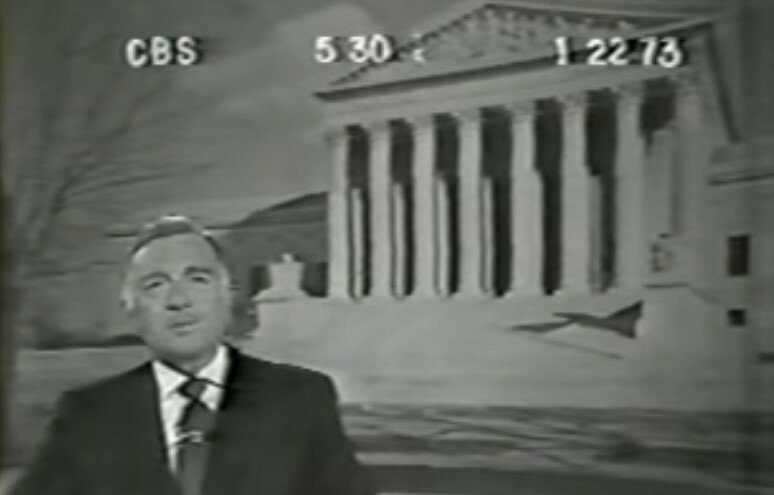 On the bottom right of the site was a four-minute-long kinescope of CBS Evening News, anchored by Walter Cronkite, in which Cronkite announced that the unnamed decision that day had “legalized abortions.” Correspondent George Herman took it from there to explain the details of Roe (and Doe v. Bolton). When I first saw it, in light of the ancient technology (and the 46 years that have passed), I couldn’t help thinking of Cronkite’s “You are There” series which used real network correspondents to tell historical stories as if those stories were being televised live. Only this, of course, was not a re-enactment from the past, but living history. Needless to say, Herman, like all correspondents, only partially described the decision[s] accurately. Three things stood out. One was a reference that later in pregnancy states could take action “to protect the unborn child”! Second, the decision[s] “thus sets limits on the right to abortion on demand,” which, in fact, they did not. Two guests were briefly interviewed. The first was Alan Guttmacher, “president of the Planned Parenthood Federation of America and a leader in the International Planned Parenthood Federation in the 1960s and early 1970s,” according to the Guttmacher Institute (GI), formerly known as the Alan Guttmacher Institute. GI was spun off from PPFA in 1968 and has ever since earned the misbegotten reputation as a non-partisan source of abortion-related information. Father James McHugh gave the pro-life response. At the time McHugh was executive director of the U.S. Bishops’ Office for Pro-Life Activities. McHugh (who later became Bishop McHugh) spoke of the decision having withdrawn “human rights” from the unborn. “The judgment of the court will do a great deal to tear down the respect previously accorded human life in our culture,” he accurately predicted. That is not the case for one reason and one reason only: you.